Under the effective supervision of our reputed mentor Mr. K P Saravanan, it is becoming the fastest growing company of the industry. They are highly experienced and knowledgeable professionals of our company that help them to manage the entire business activity in efficient manner. On the other hand, they perform all their activities with full dedication and sincerity. Manufacturing and Trading of Frozen Food Products and Juices. Our company has supported by an ultra modern infrastructural unit that is perfectly segregated into various units. This division helps us to fulfill the requirements and complete the given consignments of the customers on time. Also, all the departments are facilitated with required tools and equipments in order to maximize the production and complete all the work efficiently and easily. 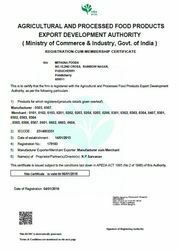 we at mithuna foods company India, are committed to excellence because of our fully trained Masters in Chef, Our Periodically inspection of goods starting from our Floor till our packing, fully watched & automated system advising on batch that leaves our factory till our direct or end customers base, a customer satisfaction note goes to the individual Chef or Customer who uses or product who can access our Directors Directly ,.. by doing this all staff are Well Trained to be the Ultimate in Service Lice with par on this competitive world..
We are the BEST In Deliveries Compared all other service or manufacturers in the FROZEN FOOD WORLD..
WE AT MITHUNA FOODS ARE APEDA AFFILIATED,MEMBER SPICE BOARD OF INDIA,. Team work is most essential thing for the success and growth of an organization. With believing in this statement, all the employees of our company work together with great efficiency and dedication as a team. This team work makes us able to attain the maximum satisfaction of the customers by offering them fresh and healthy eatable products according to their exact demands. We are the total solutions for frozen foods,Hotel Industry,Resutaurant,Blue prints for bars/restaurants,Garden party Restaurant/Marriage Halls/Industrial Kitchen & Catering, etc. Mithuna Foods is the most prominent company in the industry for providing superior quality products, performing ethical business practices and their customer oriented approach. Also, clients are the first preference of our company and we perform all the activities in order to satisfy our customers completely.